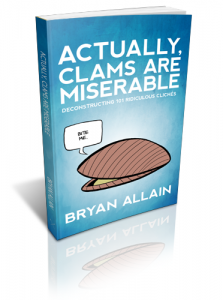 Bryan Allain is hilarious, and his new book is available: Actually, Clams Are Miserable: Deconstructing 101 Ridiculous Cliches. It’s the perfect gift or stocking stuffer for that humor lover you never know what to get for Christmas. Andi Cumbo has put together a free e-book, God’s Whisper Manifesto. I want to explain why this place will be one where everyone is welcome, where money is a tool not an indicator of worth in any form, where we will be as conscious of our resources as we can without putting them before people, where all work is valued whether it be songwriting or car repair or accounting. Sign up to for Andi’s email newsletter and you’ll receive God’s Whisper Manifesto free on December 1st. Lisa Delay is offering all four of her e-books for free! 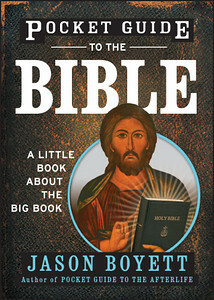 Jason Boyett is offering 48 copies of Pocket Guide to the Bible FOR $4.80?!?! On Tuesday and Wednesday, Ed Cyzewski is offering an e-book for free: Creating Space: The Case for Everyday Creativity. Check it out HERE. My friend Darrell Dow recently released an e-book, Fundamental Flaws: Seven Things Independent Fundamental Baptists Get Wrong (And How to Fix Them). It’s only $2.99! Check that one out HERE. My e-book, Building a Life Out of Words, is available today for $3.99. What other deals are out there? Let us know in the comments. Really grateful that you included me! Thank you.